Two Sundays ago, the second day of GrowFest!, I took a break from selling seedlings at the Bee Heaven Farm tent to stroll around and visit some of the vendors. It wasn’t all plants at GrowFest!. There was plenty to try and buy, much like a farmers market. Melissa’s new book is available for pre-sale. The first tent I saw when I entered the park belonged to Urban Oasis Project, one of the event sponsors. Had a chance to chat with Melissa Contreras, founder of the local non-profit. 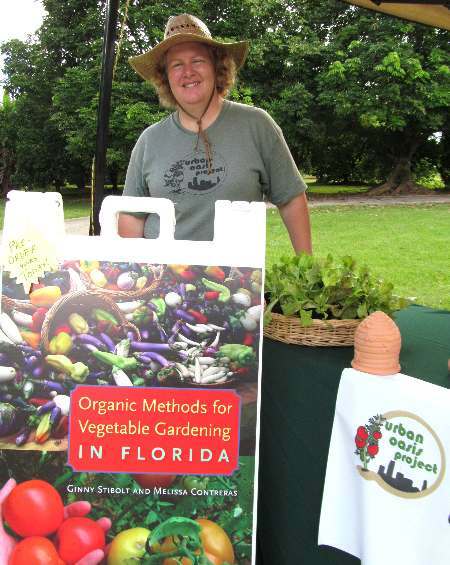 She is extremely knowledgeable about growing food, and spent the last year writing her new book, Organic Gardening in South Florida, and Marty Mesh wrote the foreword. It will be published by the University of Florida Press in February 2013, and is available for pre-order for the reduced price of $25 at the Urban Oasis web site. 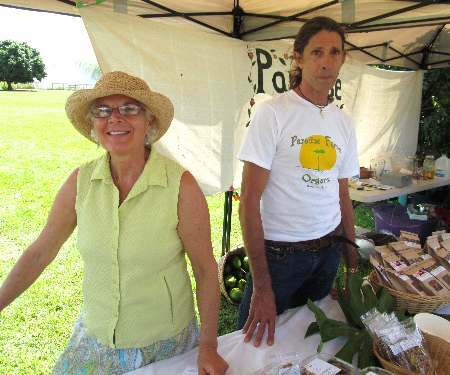 Organic farmer Gabriele Marewski (left) at the Paradise Farms tent with some of her flax crackers and organic herbal teas. Since I have limited space for growing plants on my Balcony Farm and didn’t want to get too many, I was more interested tasting local food and drink. And there was plenty of it on hand, almost all made using locally sourced ingredients. Paradise Farms Organic had an assortment of flax seed crackers called “jump food,” (a play on “junk food”) but their dried oyster mushroom snacks were very popular and sold out before I could nibble on a crumb. Farmer Gabriele Marewski also offered a line of herbal teas made from dried herbs and flowers grown on her certified organic farm. 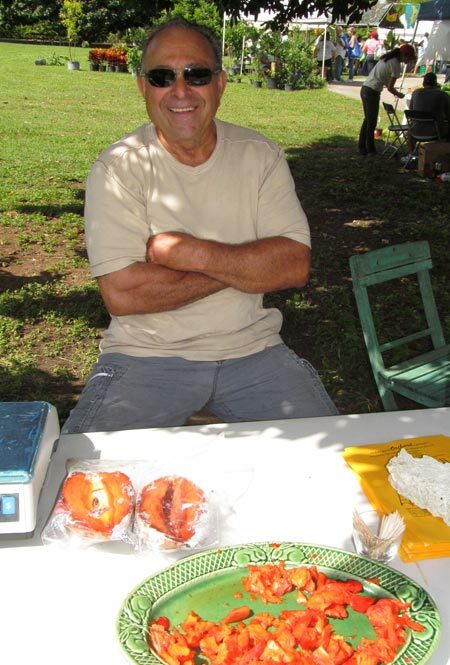 Grower Sal Santelli with samples of his candy-sweet organic mamey. Bet you can’t eat just one bite! 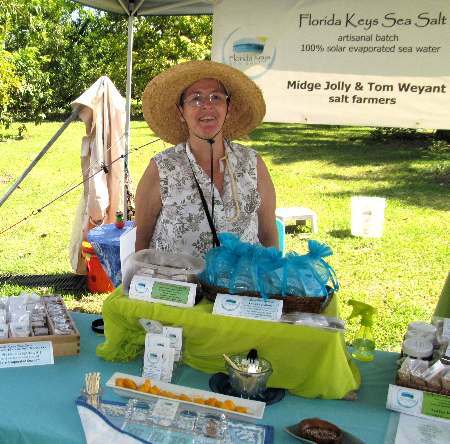 Salt farmer Midge Jolly with samples of salts, spices and sponges. 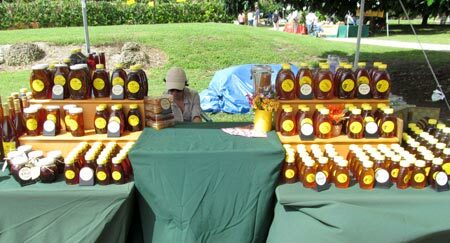 Miguel Bode has a wide assortment of local and Florida honey. Two beekeepers, Miguel Bode and Rigo De La Portilla aka the Tattooed Beekeeper, were selling their honey. Miguel Bode keeps hives at Bee Heaven Farm and Paradise Farms, among other local spots. His wildflower honey (which I have been buying for years) is available to Bee Heaven Farm CSA members either as part of their share or as an add-on. 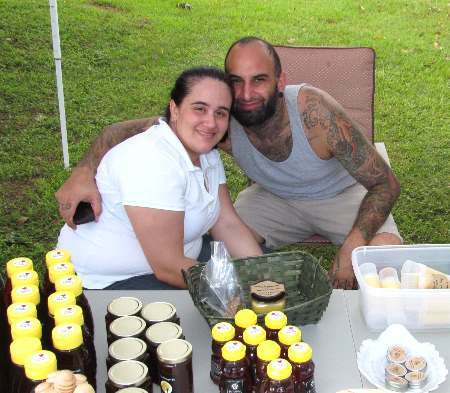 Rigo De La Portilla, The Tattooed Beekeeper, and his wife Eliza with honey, lip balm and other handcrafted bee products. Rigo gave several demos on backyard beekeeping on both days, and brought sample hives. Over at his tent, along with different size bottles of wildflower honey, I found candles and balms and other beeswax products which his wife Eliza makes. I smoothed on a rich, honey-scented lip balm with propolis that immediately soothed my lips, and sniffed the delicate scent of honey and goat’s milk soap. Eliza aka The Tattoooed Beekeeper’s Wife has a wide assortment of bee products that can be ordered online at her Etsy shop. 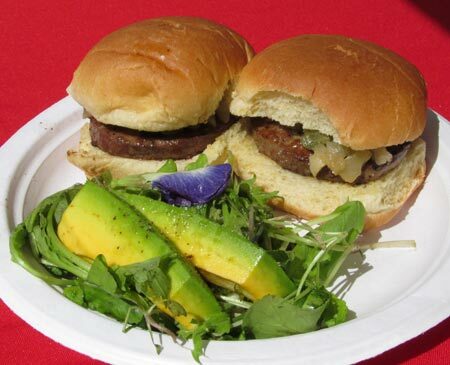 In the Battle of the Sliders, the reigning champs: grass-fed beef sliders prepared by Chef Adri Garcia. 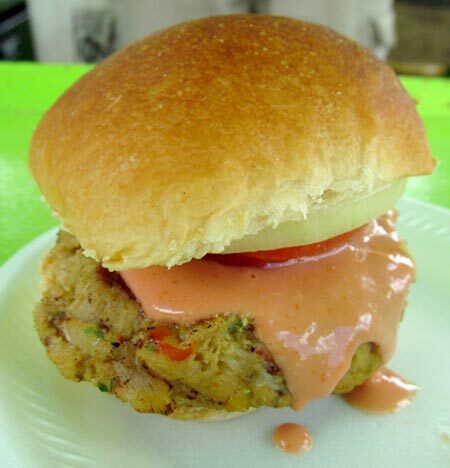 In the Battle of the Sliders, the contender: grilled crab cake prepared by Jason Mira of Native Conch. My eating and drinking tour concluded at the “food court” of several prepared food vendors and picnic tables. Over at the lime green and pink Native Conch trailer, Jason, George Mira’s son, made me a grilled crab cake made from lump crab meat mixed with panko crumbs. It was tasty but I still love their conch salad. The line for falafel wraps and jackfruit curry (which sold out quickly) at Hani Khouri’s tent was a mile long, but I was too hungry and impatient to wait. Took my growling stomach to Chef Adri Garcia’s tent to get some Florida raised grass-fed beef sliders seasoned just so. They were topped with sauteed onion and peppers, and served with a local mixed greens salad from Paradise Farms, dressed with a balsamic vinaigrette. Not bad for festival food! For dessert there was Roc Kat Ice Cream, a recent addition to the local food scene. I had hoped for a scoop of pineapple brown sugar ice cream, but it had sold out. Roc Kat sells handcrafted ice cream all around town, so look at their site to track them down. What’s a festival without music? Around the corner from the food court the music tent was set up. 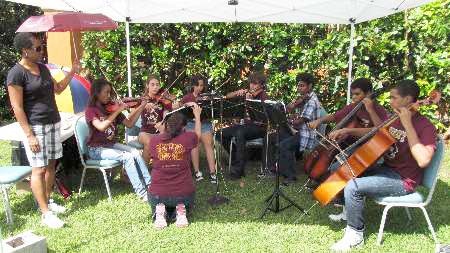 On Saturday, kids from the Robert Morgan Education Center String Chamber Ensemble played. The talented teens were really quite good! 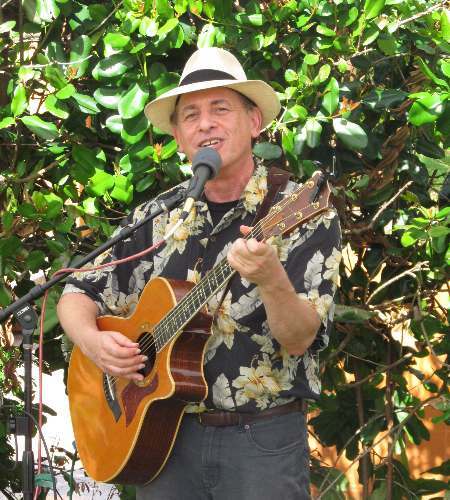 On Sunday, local singer-songwriter Grant Livingston sang his original playful and witty songs about life in Florida, including my favorites “Homestead” and “Armadillo.” Oh-ee-oh-ee-oh! Cuckita “Cookie” Bellande and her husband. 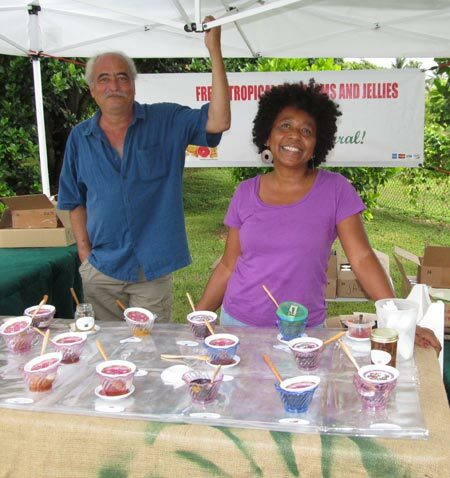 Their Rochelois Jams are made from locally grown tropical fruit, and the flavors are worthy of a happy dance. Try monstera, jakfruit, and calamondin. If you missed GrowFest! 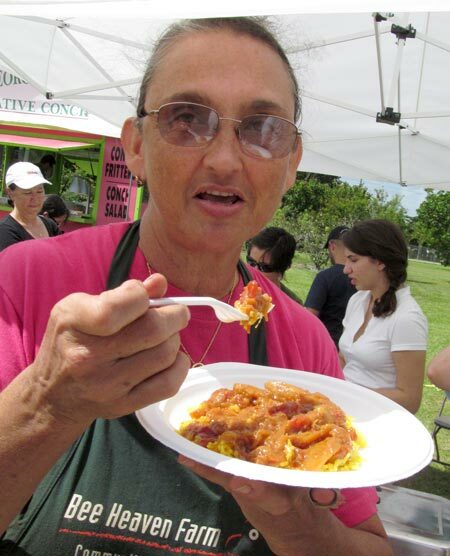 this year, it will be back at the Fruit and Spice Park again next year. “Yes, we’ll do it again,” Margie said. “This will be the ‘go to’ place to gather what you need to grow and garden. 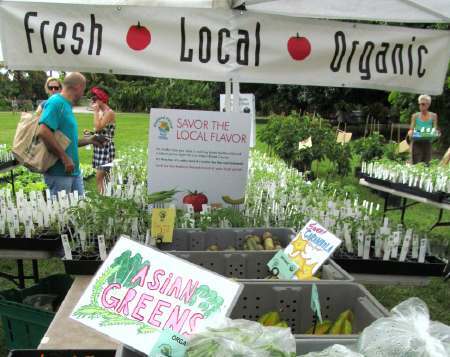 Next year, we can plan on even more types of seedlings (or seeds) and plants, fertilizer, garden tools, pots, etc.” If you missed out on getting tomato and vegetable seedlings from Bee Heaven Farm, “we’ll have some starts when we return to Pinecrest in December,” Margie added. To see more pictures, check out the GrowFest 2012 album on my Facebook page, and the Bee Heaven Farm’s Facebook page. At the Bee Heaven Farm tent. god bless you, Marian, for helping create a community with your blog and your effort. The Robert Morgan String Ensemble is more than ‘quite good’ … they are Superior! They consistently achieve Superior ratings in adjudications, and are a seriously hard-working group of young people. They felt honored to be invited to the 1st Annual GrowFest, and a great time was had by all. It was really an excellent event.